Create and share Time Reports by day or place. Attendance reports display a summary of employee attendance based on Wearable Time. The only difference between attendance by day and attendance by place is that attendance by day only accounts for the first and last time the employee is tracked for each day. At the bottom left part of the screen, Click the button with your Initials on it and Click the "Attendance By Day" button. 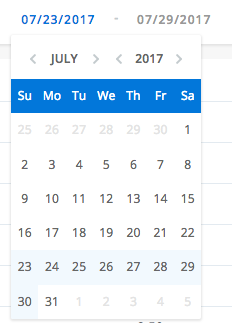 Click the Beginning Date and Select the Date you wish to begin the attendance by location report. Click the End Date and Select the Date you wish to end the attendance by location report. This report contains a greater sense of detail into what happens during the day. It breaks down the clock ins and clock outs throughout the day based on your companies' facilities locations. At the bottom left part of the screen, Click the "Attendance By Place" button. Click the Beginning Date and Select the Date you wish to begin the attendance by place report. Click the End Date and Select the Date you wish to end the attendance by place report. Want to use the data in Excel? Click the "Export to CSV" button at the top right part of the screen. Want to export and integrate with one of your existing systems? Contact us via Live Chat or E-mail to get assistance with getting your data in a specific format.